Microsoft software uses the Uniscribe library usp10.dll to support complex text rendering. Unfortunately only Windows XP Service Pack 2 and later have the required features (ligature and context specific positioning) installed. However, if you have Windows 2000 or Windows XP without Service Pack 2, you can still update the usp10.dll file by following the instructions below. The easiest way to upgrade your Uniscribe DLL is to download VOLTSupplementalFiles from Microsoft. Next, download installUsp10.bat into the same directory as VOLTSupplementalFiles.exe and double click on installUsp10.bat in Windows Explorer. If this does not work, please follow the instructions below. You may get a Windows File Protection Message. Click Cancel, then Yes. You must also enable Complex Text support for correct rendering. Goto Control Panel->Regional and Language Options. 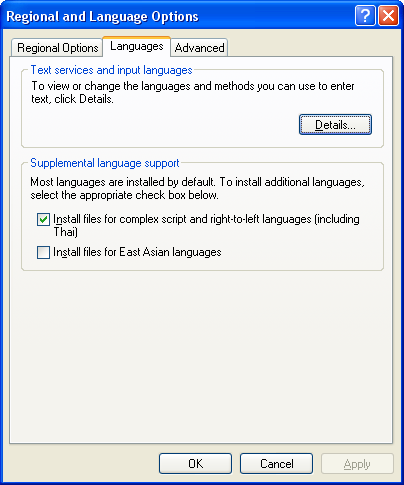 Click the Languages tab and make sure that there is a tick beside "Install files for Complex Script and right-to-left languages (including Thai)". You will need to insert your Windows XP CD-ROM to complete installation of complex script support. Updating your Uniscribe DLL by hand is slightly difficult because you have to copy the usp10.dll to your C:\Windows\System32 directory while in Safe Mode. If you have Microsoft Office installed, you will also need to update the dll in C:\Program Files\Common Files\Microsoft Shared\Office10. This is because usp10.dll is in constant use in normal Windows. Run the Uniscribe Library extractor. move "C:\Program Files\Common Files\Microsoft Shared\Office10\usp10.dll" "C:\Program Files\Common Files\Microsoft Shared\Office10\usp10-old.dll"
copy c:\Windows\Temp\Volt\usp10.dll "C:\Program Files\Common Files\Microsoft Shared\Office10"
You should now see Myanmar text rendered correctly in Internet Explorer and Notepad when using the font PadaukOT. If you have problems, it is possible that the dll is being used from another place. You can try running regedit.exe and searching for usp10.dll. This website is licensed under a Creative Commons Attribution-ShareAlike 2.5 License except where another license is explicitly stated.